St Patricks Athletic's Simon Madden tussles with Derry City's Greg Sloggett, during their encounter at Richmond Park. The Dubliner feels, although Shamrock Rovers are currently sitting eight points clear of the Brandywell men at the top of the table, a lot of teams have a chance of winning the SSE Airtricity League Premier Division. This Friday, City entertain the league leaders at the Ryan McBride Brandywell Stadium and Madden knows Derry are hard to beat, especially on their own patch. "Look, the league is up for grabs for anybody. You see Cork struggling and Dundalk not hitting top form yet, so it's open for anybody really," he stated. "If you get three or four wins on the bounce you'll find yourself up near top of the table, so it's open for any side. "Derry at home is always a tough place to go and if they are winning games, they can build momentum and you never know in this league, anybody can win it, so there's everything to play for." 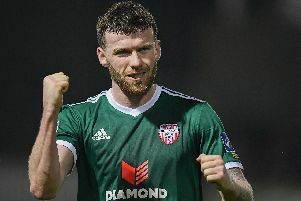 The 30-year-old, who spent two successful seasons on Foyleside helping Derry win the FAI Cup in 2012 and playing his part in helping them secure European football in 2013 campaign, was bitterly disappointed by the Saints' display against his old club on Monday. Madden admitted that Harry Kenny's side never got going and were blown away by Derry in the opening 30 minutes. "From midfield, up top and defending it was just poor all over from our point of view and we are really disappointed. We just never got going, especially coming back from a good result on Friday (at Cork City). "We are all gutted and the sending off killed us, but we never really got started in the first half. "As we were 3-0 down you are probably thinking the worst and we were probably lucky to get that goal quickly and it gave us some sort of chance. The attitude was good in the second half, we all dug in and tried to nick another one, but it didn't happen, but against 11 men it's hard when you only have 10, but yeah it's disappointing."